Wait, is this Lumbar Larry?? I tried FB but don't have an account. I just saw him a few months ago here - hope everything turns out OK!! Yes, this is "Lumbar Larry", "Brokeback Larry" and recently "Broken Ankle Larry"
To say he has had a string of bad luck is an understatement. I saw him in January when we were down there and he seemed like he was in good spirits and healing well. He has been part of the gringo LV community for many years. I am certain that they want give up until he is found. Everyone keep Larry in your prayers or thoughts or whatever belief system you have. He and the searchers can use your positive energy. Attached are missing person posters in English and Spanish. Please share liberally with anyone with Baja connections. Thanks, everyone. HI, I created the group to get as many people involved in searching for Larry as possible. I know everyone has a lot of questions, I will give you only confirmed facts. 1. Larry had dinner Tuesday night at Los Pichus diagonally across from Star Mart with 3 friends. 2. He walked home from there at about 8pm. 3. Around 8am on Wednesday a neighbor found his gate open and trailer unlocked. Apparently only things missing appeared to be wallet and ATV (his phone was found in the trailer). So we are looking at a 12 hour gap of his disappearance. 4. Friday a search turned up his missing ATV at 4:15pm on the road going west up from Diamant� Real Estate to where it dead ends by a yellow house....the grey unfinished concrete block "hotel" is just to the southwest of there. 5. There was fuel in the ATV but the key was gone. 6. La Paz hospitals and jails all checked and police,federales, and US consulate as well as Larrys sister all contacted. 8. Saturday more searches were conducted and an American man from La Paz who does missing person searches and investigations came to help and talk to officials. I have not added specific names on purpose. Police know who they are. Our local gringo contact will be Chris Dyer. There is also a what's app group that has been formed. I will post any updates on here as I find out. 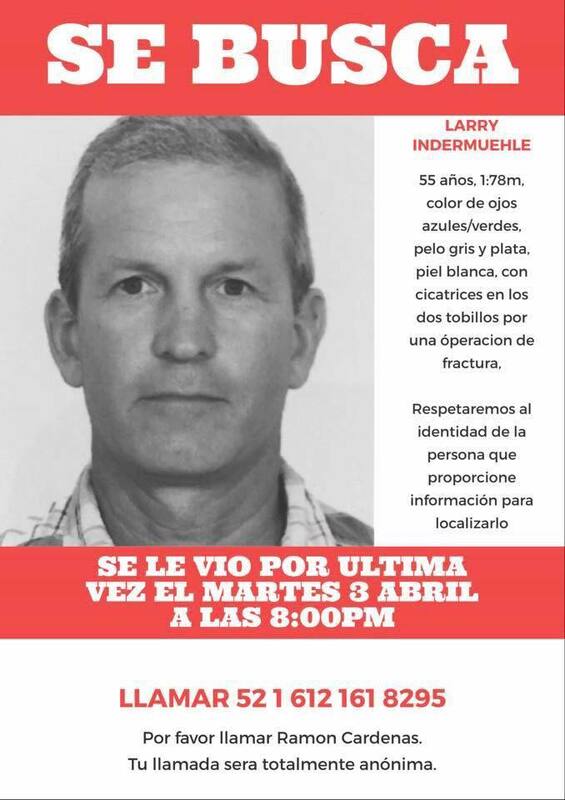 FOLKS WITH LA PAZ connections: There have been some encouraging potential local sightings of Larry, appearing confused, between La Ventana and La Paz. If you have friends or any connections in the area, please ask them to copy and share the missing-person posters in this thread. Thank you. If anyone knows of a way to donate funds directly to the search for Larry, please post it. This is a super good guy. I worked with him at Meadows for a number of years and it really bums me out to hear the news. Did Larry ever show up? There is no positive news or updates. They have elected not to post a reward since it would promote kidnappings. The LV locals don't have that type of mentality. Larry is fluent in Spanish which increases his chances for survival! 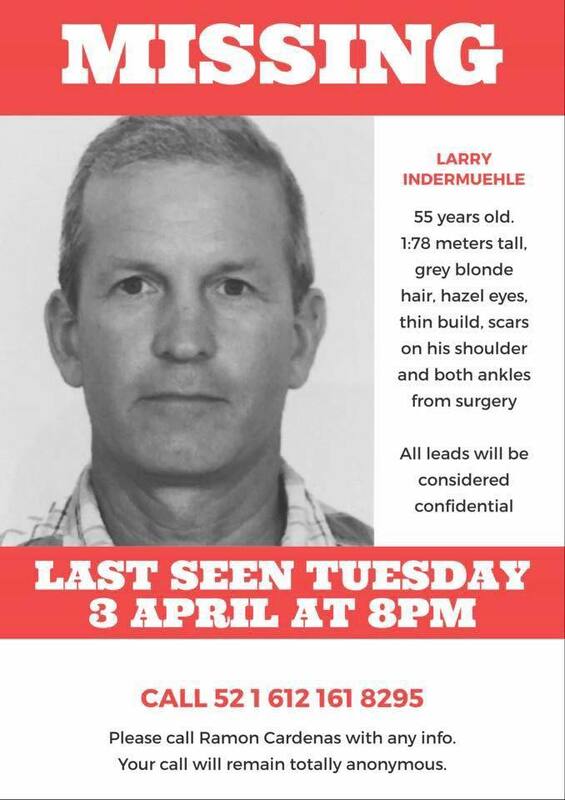 Larry Indermuehle Update - Official organized searches were on-going throughout the week of April 16th but have now been suspended. The La Paz volunteer group and a search and rescue dog with his handler combed La Paz and surrounding areas and will continue to follow up on any further clues and information. A family member and friends broadened the search area these last few days. Lots of remote ranches and small towns both north and south of La Paz were visited and flyers posted. Another aerial search is currently being looked into. Tue Dec 04, 18 9:43 am Where is Larry? I'm down here now and no positive news. Adam is staying on his property for the season .